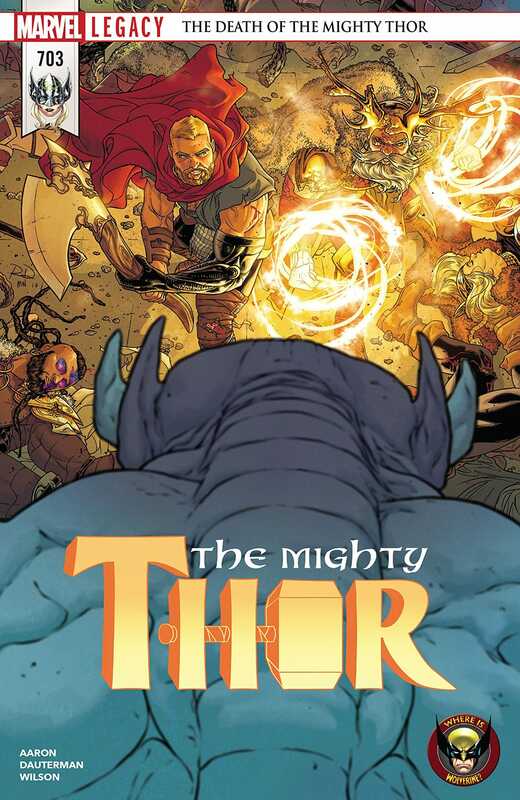 The Mighty Thor #703 review: The End is Nigh – AiPT! Jane’s battle with cancer is paralleled by the destruction come to Asgard. There has been an intense duality in Thor since Jane Foster took over the mantle in 2014. Thor is a nigh invincible god, beautiful and strong. Jane is brilliant, but her body betrays her. Mjolnir, the very thing that gives Thor her powers also strips Jane of any treatment for her cancer and in fact accelerates its growth. Threats pile into the ten realms and Odin is absent. Thor must fight for those who cannot fight for themselves, but Jane Foster cannot stand under her own power. If Thor is to live, Jane Foster will die. This duality only intensifies as, in The Mighty Thor #703, the power of a billion billion tortured souls arrives in Asgard seeking vengeance above all else. Without Thor, how can the gods of Asgard stand against the might of Magog? After collapsing at Odin’s door in Asgard, Jane finds herself in a hospital bed, surrounded by the only people who know she is also Thor: The Odinson, Falcon, Roz Solomon, and Dr. Strange, Veterinarian. With Dr. Strange’s help, Jane finally gets a full explanation for what has been happening to her over the past few years. While her initial diagnosis was positive, what began as treatable stage one breast cancer has metastasized into her liver. While still potentially treatable, the chemotherapy she has to undergo is stripped from her system by Mjolnir every time she transforms into Thor. The reverse transformation has been slowly, but surely, killing her. One more transformation into Thor will most likely kill Jane Foster. With the mighty Mangog running loose in Asgard, Mjolnir appears to Jane and she must make a choice. Despite even Odinson in the room stopping Mjolnir momentarily, it is up to Jane to make the decision whether to say goodbye to her life or at least try and beat this invasive cancer. Meanwhile, Mangog tears some things up. Asgard has seen its fair share of destruction, but the Mangog takes things to a new level. As always, the beauty of the illustrations by Russell Dauterman is increased exponentially by color artist Matthew Wilson. The dedication to non-traditional paneling on page after page tells the story with a clarity that should change the way people both read and write comics. The color arcing away from the Bifrost while Mangog sweeps its tail across the Rainbow Bridge forms the frame of the ½ page panel while each successive panel shatters more and more as Mangog strikes the bridge itself. This is storytelling through art. Jane’s battle with cancer is paralleled by the destruction come to Asgard. The whole of both Jane and Asgard are threatened with complete destruction by an enemy that seems unbeatable. One must be conquered by force while the other must be confronted by patience and time-consuming treatments. Will one fall? Will both? While I, personally, don’t want this story to end, I can’t wait to see where it’s going. Bonus Wolverine sighting! Not going to spoil it, but it is a nice tag on the issue. Where's Wolverine? I don't really care.